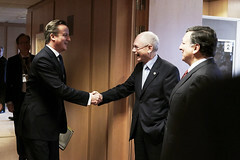 Eu Council: President Van Rompuy welcoming the British PM David Cameron by President of the European Council, on Flickr. It’s now certain that Jean-Claude Juncker will become President of the European Commission. The European Council (the heads of government of the 28 EU states) voted 26–2 in favour of Juncker — only the UK and Hungary voted against — and getting approved by the European Parliament is a formality in this case. I’m not at all impressed by the way David Cameron has conducted his campaign against Juncker, and it bodes ill for the UK’s future in the EU. From a federalist continental European perspective, Juncker looked like a popular and democratic choice. Everybody has been complaining about the lack of democratic legitimacy for ages, and an obvious improvement was made possible by the fact that the Lisbon Treaty requires the election of the Commission President to “take account of the elections to the European Parliament”. Each of the European political parties (political parties in European countries are affiliated to these) therefore put forward a candidate (a so-called “Spitzenkandidat”, using the German word) prior to the elections. Most voters in the UK might not have been aware of this, but a vote for Scottish Labour was also a vote for Martin Schulz to become Commission President. The result of the elections was that the European People’s Party (which didn’t field any candidates in this country) again became the largest party, and therefore it was natural that their Spitzenkandidat, Jean-Claude Juncker, should become President. However, Westminster wants to roll back the EU, so they block all moves towards federalism (which in an EU context means making joint decisions democratically in the European Parliament and the European Council). It was therefore obvious that Westminster didn’t want Juncker — he’s a committed federalist, he was backed by the European Parliament, and he didn’t owe Britain any favours. They wanted to veto him and instead elect a useless compromise candidate that would ensure the EU didn’t achieve much. This has often been Westminster’s way. Perhaps the most blatant example was seen 20 years ago, when John Major vetoed the appointment of Jean-Luc Dehaene, after which Jacques Santer was appointed in his stead. Since then, national vetoes have been removed from lots of places in the EU, and Cameron didn’t have the power to veto Juncker, which is perhaps why this tried and tested method of sabotaging the EU didn’t work this time. In retrospect, Cameron should have tried to prevent Juncker from becoming the EPP’s Spitzenkandidat, but that was impossible because of his stupid decision to pull the Tories out of the EPP and set up its own Eurosceptic political group (the ECR), which now includes Danish and Finnish xenophobic parties in a failed attempt to prevent UKIP from getting enough members to create its own group in the parliament. However, this leaves Cameron and Westminster in a very bad position. They have antagonised the new President of the Commission by making their opposition to him very public, and it has also become clear that the other EU countries aren’t bending over backwards in the hope that it will entice the British population to vote to remain in the EU in the in/out referendum. It seems increasingly likely that Cameron won’t be able to negotiate any significant exemptions, and that rather than rolling back European integration, the threat of a British exit will actually encourage the federalists, which again will make it increasingly hard to get the mainly Eurosceptic English electorate to vote to remain in the EU. Today’s events have made it much more likely that the country led by Westminster will leave the EU in a couple of years’ time. The question that remains is whether Scotland remains in the EU together with Ireland, Denmark and Sweden. The move towards European federalism is actually a good thing for Scotland (because the alternative is that the big countries call the shots), and Juncker is a rather good candidate that an independent Scotland most likely would have supported. However, we can only chose to remain in the EU if we’re independent. If we vote No to independence and the UK votes to leave the EU, the only thing keeping the country afloat will be the global financial services in London. It would be a disaster for Scotland, probably even worse than the Thatcher years. The election of Juncker makes a Yes vote even more imperative. It doesn’t serve Scotland well to be represented by these numpties in Westminster who don’t even understand how the EU works, who think only in terms of vetoes and rebates. Cameron does not know how Europe works, he does not know the rules, he has ignored and belittled most of the other players and, worse, he gives every impression of not caring less. “He’s f***ed it up, he’s totally f***ed it it up.” Excuse the language, but those are not my words, but those of Polish foreign minister Radosław Sikorski — an urbane, smart, arch Anglophile Atlanticist, and an Oxford graduate and Bullingdon Club member to boot — in secret recordings, in a scandal running large in Poland. That’s the way David Cameron’s closest allies talk about him when they think the recorders are off. In the cafés and bars of Brussels in recent weeks I’ve heard worse language than that used to describe the Prime Minister. I’ve been spending quite a lot of time in England recently and I can confirm that this debate about federalism barely figures on the metropolitan radar. What does figure is a very widespread hostility to the European Union of a kind we very rarely hear in Scotland. This isn’t got up by the press. Many ordinary English voters seriously believe that Europe is bossing them around, taking their cash, flooding them with immigrants and generally taking away their liberties. The strength of feeling is quite startling to those of us who have seen European integration as a broadly positive movement – an expression of internationalism. @arcofprosperity @Tighnacoille Cannae disagree with a word of that! @GaryE1869 @arcofprosperity It shows that we need that Yes or it will be London’s coattails and utter poverty. The election of Juncker means we must vote YES. RT @meljomur: The election of Juncker means we must vote YES. @alister_ru Because he’s an efficient politician with a federalist vision. Cf. my recent blog post (http://t.co/418JewMZHu). @arcofprosperity Yes, but he is no more federalist than others, plus the Commission has no real powers anyway. Good post on the topic. Stephen Short liked this on Facebook.